The goal is to stay charged longer, while lighting up the night. 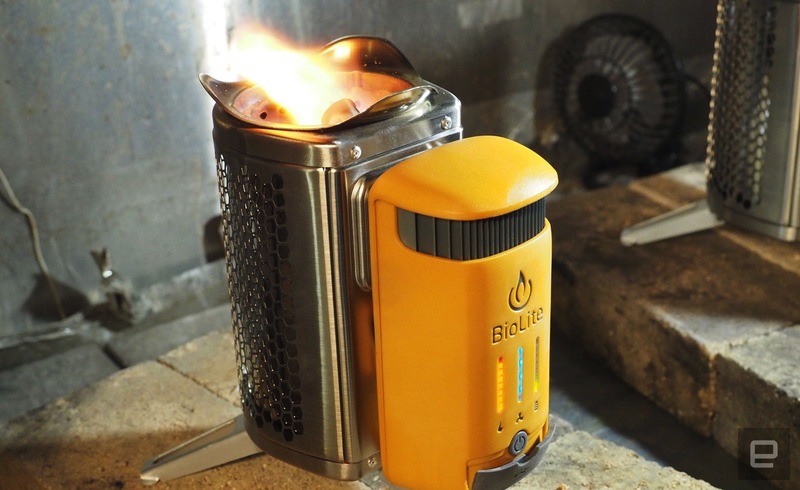 BioLite released most of its 2017 product line today, spearheaded by the new and improved CampStove 2. All the products share common design features, centered around either battery improvements, expanded lighting possibilities, or both. Along with the redesigned stove, which now includes onboard power storage, there's a double-wide solar panel, heavy duty portable batteries and, in the spirit of keeping you charged up, a coffee press. 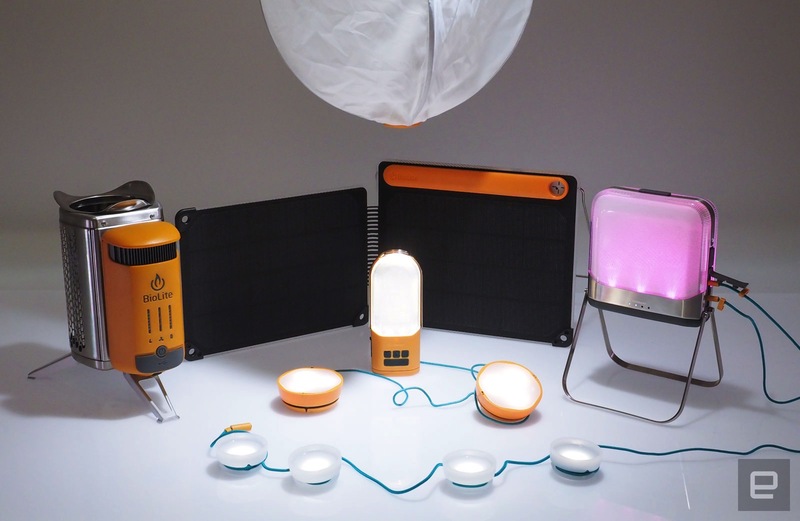 The company has also expanded its NanoGrid lighting system by adding a collapsible and hangable diffusion light, a scaled-down version of the daisy-chainable SiteLight series and the long-awaited arrival of the BaseLantern. While that's a lot of gear, BioLite has focused on portability and smaller sizes to help you get the most out of your off-the-grid travels. While these are generally designed for life in the great outdoors, some of these products can probably earn a spot in your everyday routine. The first product out of the gate this year is the new wood-powered CampStove 2, which generally looks and acts like its predecessor providing thermo-electrically generated power, albeit with improved electronics. Instead of simply providing a pass-through for charging, its able to store some of that juice with its on-board 2,600mAh battery. 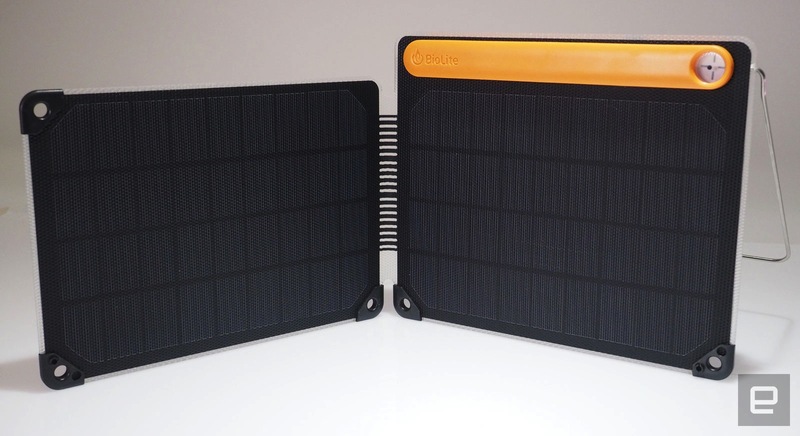 When the sun's out, you'll be able to double your solar charging capability with BioLite's new SolarPanel 10+. The design is similar to the preceding 5/5+ series, except that you get a pair of five-watt panels doubling the output. This unit has a 3,000mAh battery for improved post-sunset charging levels, along with a USB charging port and micro-USB for manual recharging. The exterior coating on this new model is made of softer, more tactile material that spans both panels across the hinge area, which allows the two sides to fold in or out. When they're not sipping at the sun's rays you just snap the corners together to keep them closed. The standalone Charge Series of rugged battery packs are on the horizon, but there's no exact release date yet. They're encased in stainless steel with charging slots along the top and will arrive in three sizes: 10Wh, 20Wh and 40Wh. More detailed specs have yet to be provided, but the smallest is similar in size to a lighter, with the largest a bit wider than a deck of cards. They have more heft that you'd usually find in portable batteries, but they're built for rough-n-tumble activities. After some delays, the previously announced BaseLantern and BaseLantern XL are scheduled for an April 15th release (although you can pre-order now). Both products have the same exterior, however the standard BaseLantern has a 7,800mAh battery, while the XL model offers 12,000mAh. Both units have two USB charging ports, a micro-USB for recharging and two SiteLight ports for expanding your lighting setup. There's a separate control for the SiteLight output, so you can dim those independently. The design is compact with a bit of heft, measuring 5 x 5 x 1.73 inches (or about the size of a sandwich) with two fold-out stainless steel legs to raise it off the ground. It's IPX4 splash resistant, so a quick shower is fine, but I would avoid leaving this out all night in the pouring rain, just to be safe. The most useful feature here is the introduction of a mobile app to control the lighting and set up the proximity feature. You get white or full-color LED lighting up to 500 lumens, with adjustable settings for brightness and warmth (for plain white). If solid colors don't float your boat, pre-sets give you the option of running the light as a strobe, pulse or just chill with smooth transitions across the color spectrum. While the lights are bright and there's a wide color gamut, they are edge lit and it's not exactly the same output you'd get from a Philips Hue type bulb. These are multi-faceted, however, and can easily find a spot in your home environment to add a splash of color or light up a park picnic as easily as a campsite. 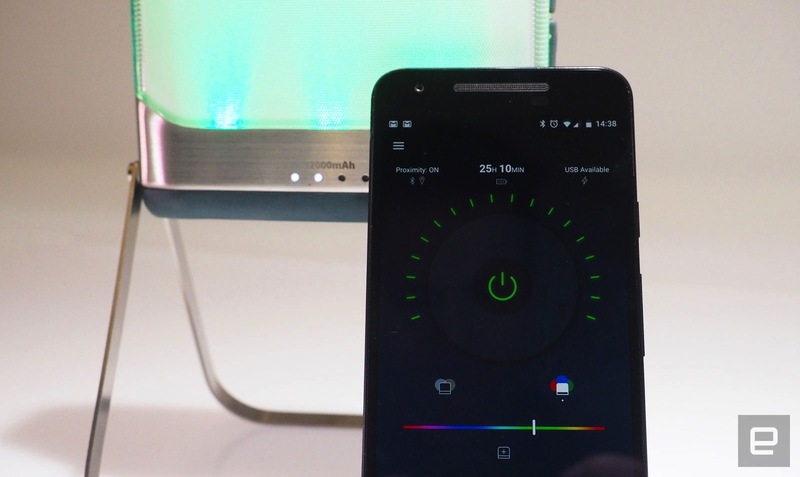 The BaseLanterns support Bluetooth LE, which lets you remotely power them up with the app and also set up proximity controls to shut the light down as you leave and/or back on when you return. After having this at my desk for a while, I can tell you that the proximity control works pretty well, surprising me a bit each time after switching on when I sit back down. The application also lets you view the remaining battery life for your BaseLantern, calculating the time in hours and minutes based on your current output set up, which is a special and useful treat. With either BaseLantern, the PowerLite or any USB power source (using BioLite's new USB to mini adapters) you can host the various hangable lighting options released today. Along with the original SiteLight pods, you can now string the SiteLight Mini and SiteLight XL to further illuminate your surroundings. The SiteLight Mini is a holiday-like string of four LED lights with 10-feet of trailing cable, to give you some distance when setting up. When you're packing up, they conveniently snap into each other like a centipede. The SiteLight XL is a collapsable ball-shaped diffuser with LED lights inside, which helps to spread illumination without any troubling glare. The 15 feet of cable on the XL gives you additional flexibility for placement, possibly on a tree branch above. When it's time to break down, the XL is a twist and a press away from being a compact bundle (although it may take a few tries to perfect it). All these lights can be daisy-chained together with additional units to fill the area with light -- even better if you use the USB adapter and a battery to free yourself from cabling to a centralized lamp. The majority of the new releases are available today on BioLite's website, including the CampStove 2 ($130), SiteLight Mini ($20), SiteLight XL ($30) and SolarPanel 10+ ($130). The BaseLantern ($100) and BaseLantern XL ($130) will ship on April 15th, and the rugged trio of Charge Series batteries ($25 to $60) should arrive in the coming months.